Above: Harley Clark, flashing the Hook ‘em Horns hand sign at the 2013 Gone To Texas freshman convocation. Harley passed away in October 2014. Photo by Marsha Miller. Harley liked the idea, and decided to introduce it at Gregory Gym rally. He demonstrated the sign to the crowd and promptly declared, “This is the official hand sign of the University of Texas, to be used whenever and wherever Longhorns gather.” The students and cheerleaders tried it out (some seemed to have it backwards), and Harley led a simple yell, “Hook ‘em Horns!” with hands raised. Sometimes, when recounting the story, Harley said that Dean Nowotny also demanded, “Do you know what this means in Sicily?! !” Or Italy. Or Europe. I asked Harley if it were true, did Nowotny really say that, and Harley admitted that it was the only embellishment he added, mostly just to get a laugh from his audience. For accuracy’s sake, while Nowotny was unhappy that Harley hadn’t first cleared the idea of an “official” hand sign with the administration, the reference to Sicily, didn’t actually happen. Fifty years later, November 11, 2005, was again the Friday before a home UT football game. The 1955 cheerleaders returned to the campus for a reunion and special rally in Gregory Gym, where they reenacted the start of a tradition half a century before. In honor of the anniversary, the UT Tower was lit orange with a “50” in the windows. 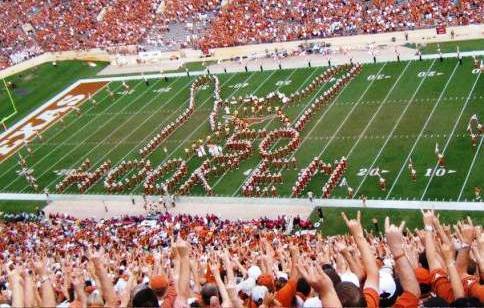 November 12, 2005: During halftime of the Texas vs. Kansas football game, the Longhorn Band performed a salute to the 50th anniversary of the Hook ’em Horns hand sign. Really interesting. In my three years at UT in the late ’70s I never knew the genesis of the Hook ’em Horns salute. Happy 60th! Kevin – Thanks for the note. Glad you liked it! Love the story! As a proud freshman in 1969, I used the Hook ’em Horns sign a lot! Kept it up over the years. Fun to know about the origin. Actually thought it was much older since it is so well recognized!! Great story. I grew up in texas and was taught the hook ’em horns sign at a young age. Living out of state now, its heart warming to read the story of the origin and hear about the 50th reunion. Hook ’em! Great Story !, so interesting 1955 the year I was born, studied in UT in 1974 , the hook sign had only19 years of age, exactly my age at the time I arrived to Austin.